Digita Accounts Production software transforms your workflow and frees up your time to focus on more important work. Prepare compliant final accounts for a whole host of entities and file online to Companies House. Stay in control at every stage of your reporting process with the ability to add iXBRL tags directly from within your report. How to produce a set of accounts and file online (1:51) See how Digita Accounts Production allows you to prepare compliant final accounts and file online to Companies House. Be compliant and prepare annual accounts for a whole host of entities. Map your clients’ nominal codes in seconds using our import functionality. Why use accounts production software? Gain access to standardised financial statement formats and reports. 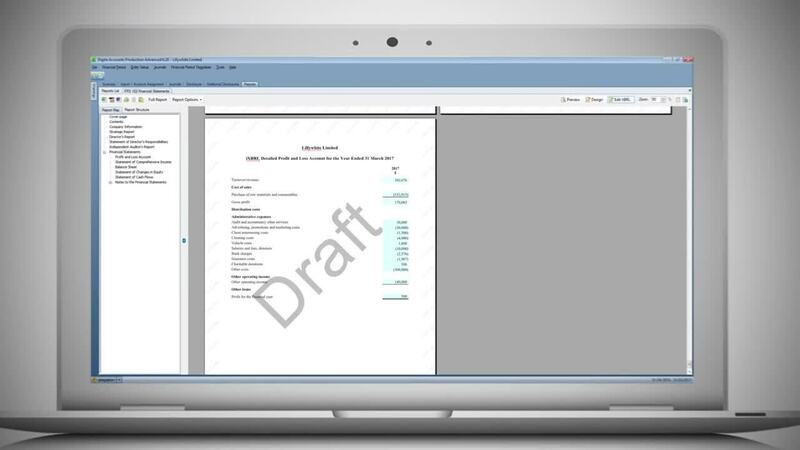 Edit report templates to include branding, tables, disclosures and notes. Quickly drill down through your report to select the appropriate tag. Changes made to accounts are always user stamped and dated. Send your client accounts to Companies House with our filing tool. Our range of legislative and iXBRL-compliant financial reporting templates can be branded and edited to suit each of your clients. Get the best from Digita Accounts Production with the fully integrated Digita Professional Suite. Our feature-rich software grows with your practice and enables you to better service your clients. Built around a central database, integration empowers you to do more with less.